But it's now going to "make it possible"
During its keynote speech at MWC 2013 Huawei admitted it hasn't had an easy ride in the smartphone market. 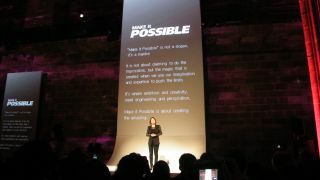 Huawei Device's Global Brand Director, Amy Lou took to the stage and explained the Chinese firm has had it tough over the past few years, but it's now looking to kick on. Lou said: " It's been difficult to shift from an ODM white label brand to a Huawei brand, and it's been difficult to shift our focus from feature to smartphones." The Chinese firm, currently the third largest smartphone provider in the world, has big ambitions which goes some way to explaining it's new mantra "make it possible." "We're an ambitious young brand which plans to be one of the top 100 companies in the world in the coming years", explained Lou. For Huawei to break into the top 100 it needs to bring powerful flagship devices to market, which it has started to do with the Ascend D2 and Ascend Mate launching at CES 2013, followed by the Ascend P2 at MWC 2013. Can these handsets help propel Huawei to challenge the likes of Samsung and Apple? Only time will tell, but the big guns of the smartphone world will need to keep tabs on this Chinese revolution.